by the owners who spent 10 years renovating it and bringing it back to its former glory. Restoration of the building has taken time to realize itself, reasonably, sustainably, in constant concern to preserve its soul and architecture. Conciliating harmoniously authenticity and modernity, the Château de Pondres wants to meet the requirements of comfort, functionality and wellbeing indispensable for an excellent hospitality. With a variety of private dining rooms including the more intimate Musique Room and Reception Room, along with the larger Etats Généraux Room, there’s ample space to suit celebrations of all sizes. If you prefer, you can even hire exclusive use of the hotel for your event to ensure the utmost privacy. 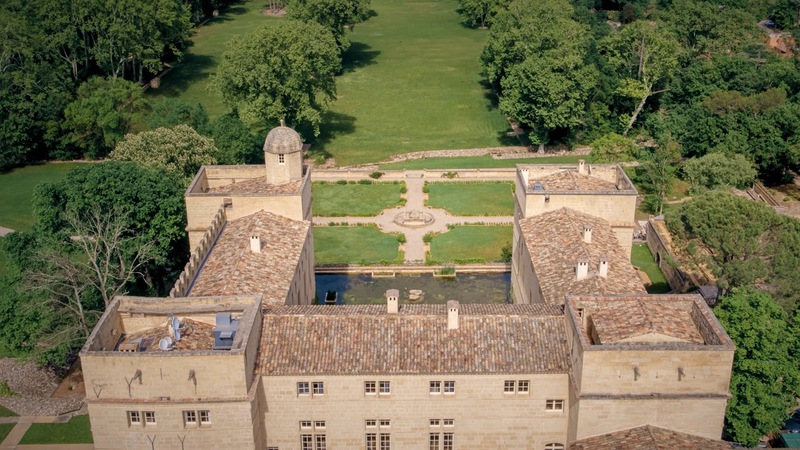 Chateau de Pondres offers an exceptional setting with a park of 15 hectares. Terraces, French gardens, Avant Cour du Château or our Cour d’Honneur will welcome aperitifs, dining cocktails and lunch/dinner. Your first meal together as a married couple has to be unforgettable, with only the finest ingredients and wines to complement the day’s celebrations. Each of our wedding cuisine menus promise a taste of luxury, or work with our head chef to create a seasonal menu, made using local ingredients, that is truly unique to your day. You can continue the evening with the presence of a DJ or orchestra until the end of the night. On Sunday, a sumptuous brunch awaits you to finish your stay at Château de Pondres. The different reception spaces are available separately, according to your needs. For an important event, the castle can be privatized. The Château de Pondres, Hotel 4*, has 10 guestrooms on the second floor. Soon, the Royal Suite of the Castle, the rooms of the Mills, the rooms and suites of the House of Woods. A space for children to play or rest is available and access to the Gardens and the Park is free. The entire facility is accessible to people with reduced mobility. Furniture and equipment, rectangular or round tables, chairs, screens and projectors are at your disposal. Our sales team is at your service to develop a personalized and tailor-made catering offer. Our rates are set according to the space used, the duration of the rental, the season, the catering services and possible options. We are at your disposal to study the quote that best meets your expectations. To obtain a quote or to make a visit, do not hesitate to contact us! Painting on canvas, animated by a deep symbolic carried by the Angels of the Annunciation. Blazons recalling the nobility of the owners of the Domaine “ecartelé du I et du III d’un lion d’or issant sur fond de gueules, du II et du IV de billettes d’or sur fond d’azur”. Altar fully restored. Simple and intimate ceremonies can take place in the chapel of the castle. Decorated with a magnificent chimney of carved stone and painted French ceilings, the Salle des Etats Généraux is a prestigious room, rich in the history of the Castle. The Latin inscription of the pediment “Beatus non est esse qui non putat” bears witness to man’s ability to achieve his own happiness, the masterful motto of the Lords. At dusk, sunsets on the Pic St Loup bathe the room with a golden light. With the adjacent Arts Room, the Etats Géréraux Room welcomes banquets and major events, in cold or humid seasons. Superb fallback solution for happy weddings, in rainy days! An essential witness of the 18th and 19th centuries, the Music Room, the Reception Room as well as the Library are organized in a series in the south wing of the Castle. Confidential and friendly spaces, these spaces welcome drinks reception, preparation of the newlyweds or spaces for children. A majestic area of 500m², the Cour d’Honneur overlooks the Park and offers stunning views of the basin, French fountains and gardens, romantic wedding in the open air and large spaces. In the beautiful days, in the complicit shadow of old stones or under the sweetness of a beautiful star night, it is suitable for the organization of your private receptions, weddings, baptisms, family gatherings. In the heart of the Castle, the Cour d’Honneur distributes the restaurant area, a Lounge Area and the Chapel. It can accommodate 200 guets in a banquet style and 300 guest in a stand-up dinning. Built in terraces, offering benches and shade trellas near fountains, the landscaped gardens are organized for large receptions, banquets or drinks receptions. The Castle’s Park, lined with a river, and its completely restored period paths, are the occasion for beautiful walks in the shade of centuries old trees in a perfect decor for your most beautiful wedding photos! Out of the turmoil world, to stop time for a few minutes or several hours… In the ancient cellars of the Castle, testimony of a history prior to the 12th century and perhaps contemporary of the beginning of our era, hammam, sauna and relaxation are have found their place, equipped with the most modern comforts and technologies. We offer a 10% discount for close family of the future married (Parents/ Children/ Brothers & Sisters). A pleasure to welcome you to the castle.